Previously, Nephi's father, Lehi, had prayed for the people of his city, who had been warned to repent or be destroyed. Lehi's prayed with all his heart for them. And it came to pass as he prayed unto the Lord, there came a apillar of fire and dwelt upon a rock before him; and he saw and heard much; and because of the things which he saw and heard he did bquake and tremble exceedingly. I find it interesting that the verse starts with pointing out that what Lehi was about to experience began as he prayed to the Lord. It wasn't after the "amen", and he stood up refreshed to walk away like we do after most of our prayers. It was during the prayer. Deep in his thoughts, while accessing his emotional heart. He was invested in this prayer. It wasn't one he memorized, or knew by heart from hundreds of repeats. Another reference seems to indicate a visit involving the presence of the LORD. In D&C 29:12 it says that when the Lord returns, He will come in a pillar of fire, with his twelve apostles. It makes me wonder if the pillar of fire that Lehi experienced also involved a personal visit from the Lord. 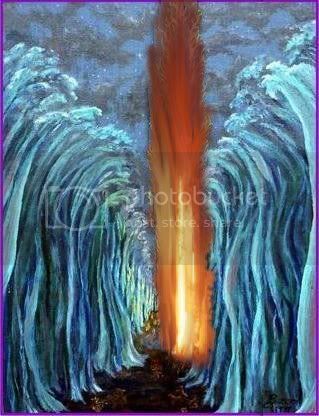 It's also interesting to note that in Exodous, the pillar of fire came "by night", while in the day, the Lord came in a pillar of a cloud. Is there a difference? Tonight I watched an outdoor movie at my kid's school. It was notable that despite trying to start the movie at 7pm –while the sun was still up –no one could actually see the movie until the sun was completely down. Perhaps the visual affects principles are the same. Perhaps we could assume that Lehi's experience was at night? Perhaps this also ties into the fact that scripture tells the Lord will come "as a thief in the night" (1 Thessalonians 5:2). And maybe not. Nephi writes that Lehi "saw and heard much". Denver Snuffer writes in Nephi's Isaiah that he is utilizing the principle of veiling. (He also discusses the significance of the "rock" upon which the pillar of fire dwelt upon. I won't explore that here, but will refer back to his books.) We are prohibited from seeing and hearing what Lehi saw and heard, but instead, like Nephi will show us later, invited to ask for ourselves. We are told that these things caused Lehi to "quake and tremble exceedingly". Has learning information ever caused you to have this kind of reaction? It causes me to pause and consider if what he learned in this experience caused excitement or worry. It's not just mild shaking. It's quaking and trembling! There is a difference! Definitely a great opportunity here for all of us to ask God and find out if He would be willing to share with us what he shared with Lehi. And why wouldn't He? At this point, we know very little about the difference between ourselves and Lehi, such that we could easily be in the same shoes as he was. Definitely a power packed verse.